Auriculotherapy is based on proven correspondences between locations on the external ear and the internal organs and systems of the body. The ear acts like an input/output terminal in direct contact with the central nervous system. Information on viscerosomatic states can be accessed via visual clues, skin electro-conductivity, and pressure sensitivity at specific points. 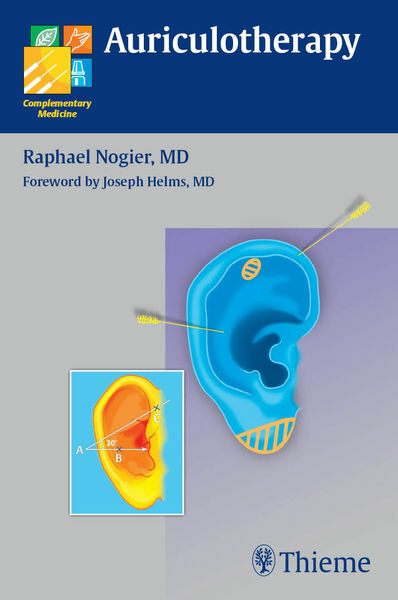 The first part of Raphael Nogier’s Auriculotherapy shows how acupuncture needles are used in sophisticated and powerful therapeutic interventions. The second part introduces the principles and practice of auriculomedicine, a true frequency medicine that evolved from Dr. Paul Nogier’s auriculotherapy, his discovery of the VAS (Vascular Autonomic Signal) in the pulse and his consequent observations of the diagnostic and therapeutic properties of radiant light frequencies on the skin. The material presented here builds on and updates the work of the author’s father, Dr. Paul Nogier, who scientifically explored and charted the auricular microsystems in the 1950s. A serviceable, contemporary work for students of acupuncture as well as practitioners, offering clear and practical information to be applied directly for the benefit of patients.